On Saturday, in Rome, on the dirt, the winners will be darn happy, and the losers will put their heads down and become disappointed. That always happens to intense players, that is. When they are great players, they have to think about what went wrong, and how they will fix it. The top players are always thinking. so this weekend in Italy, they will battle, at least for a while, and at the end, they will either make the shots, or fly away to Paris. To start on Saturday, Elena Svitolina will go up against Anett Kontaveit. Svitolina is a tough person, she is very strong, and she belts it. The 22-year-old Kontaveit is gradually learning, and she can be very steady, except that she has had a so-so year. This week, she has put together a couple terrific wins, like bashing Caro Wozniacki, and overcoming Venus Williams. But the same goes with Svitolina, who jumped over Angie Kerber, who is a very steady person. The No. 4 Svitolina is ready to grind Kontaveit until she will slip away. Rafa Nadal and Novak Djokovic will face off for the 51st time. The Serbian has won 26 times, and the Spaniard has won 24 times. On clay, Nadal has won it 15 times and Djokovic has won seven times. Clearly, Nadal is better on clay than anyone. On the hardcourts, Djokovic is better than Nadal. But this is on clay, and while Mr. Novak has played better for the first time this year, still, as he has said, he still has a long way to go. Of course, when Djokovic became hurt last year, and his steely legs began to slip, and then, he grew nervous and upset. 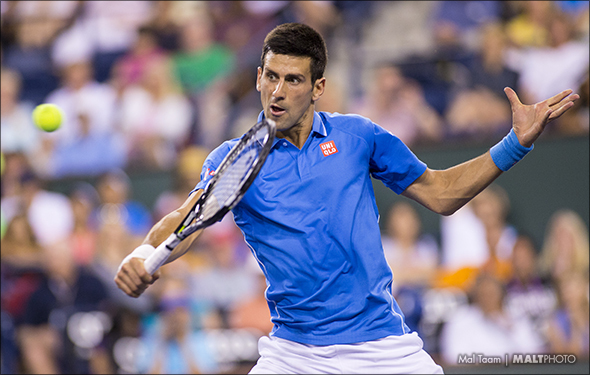 This week, Djokovic has been steady and a little more confident. But Nadal is cracking his forehand — as always — his serves are spot on, and his up and down backhand has been almost superior this week. On clay, he will attempt to pound Djokovic until he falls down. Right after that, No. 1 Simona Halep will go up against Maria Sharapova. Let us hope that it will be a phenomenal match, but the American-Russian just played for more than three hours when she edged Jelena Ostapenko on Friday. While she is pleased because her body isn’t too sore, still, she can get tired the next day. Sharapova has been better that Halep, on clay, because a few years ago, because at the 2014 Roland Garros final a few years ago, it was darn close in the third set. At 4-4, Halep began to push, while Sharapova attacked her again and again, and then she won it. Yes, Halep never gives up, and now, at the non-Slams, she will swing hard. She has yet to win a Grand Slam, though, and that is painful. But this week, in Rome, she is more calm and one way or another, she will force Sharapova to run all day. Halep is likely the favorite in Rome on Saturday. But there should be some amazing points. The last match will be between Marin Cilic and Alexander Zverev. Cilic doesn’t love clay, but he tries, he can be steady, and the tall man can smoke his serves and his forehand. In the past few weeks, the young man Zverev has played tremendous ball. He is steady, he can nail his forehand and his backhand, down the line, crosscourt, in the middle — he rarely misses it. Zverev won Madrid last week and now he has a chance to reach the final again. He might be tired, but he wants it. So does everyone … who wants it more?